The Vancouver.24hrs.ca website has a (pdf file) link to the formal complaint filed in US District Court, Case #MJ10-171 USA vs. James Peter Armstrong. The Globe and Mail reported that Jim Armstrong decided not to travel with his team mates to Ottawa where they were scheduled to have lunch with Prime Minister Steven Harper prior to a special presentation to medalists from the 2010 Winter Olympic and Paralympic Games. Coach Joe Rea told the Globe and Mail, “I thought it was a joke to begin with,” he said, adding that he received an e-mail from Mr. Armstrong when he arrived at work Wednesday saying everything was going to be okay and that he was going to be cleared. Team Canada skip Jim Armstrong was arrested at a mail box service in Blaine Washington attempting to pick up a package containing 2,800 erectile dysfunction pills. He was charged with trafficking in counterfeit goods and accused of helping to distribute Chinese-made pills labeled as Viagra and Cialis, according to a report at seattlepi.com picked up by The Curling News. "Speaking with investigators, Armstrong allegedly admitted to bringing multiple shipments of the drugs into Canada. He is alleged to have claimed he provided the drugs to another man, who in turn sold them at clubs in the Vancouver area. Jailed following his arrest, Armstrong was released after posting bond on $20,000 bail. He is expected to return to U.S. District Court on April 30 for a preliminary hearing." Were the charges to result in a conviction, it may affect Armstrong's future ability to travel to the USA. 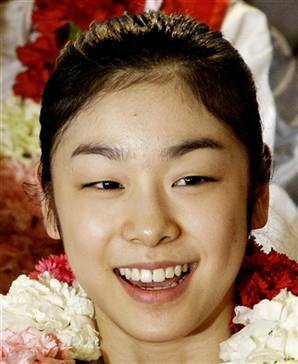 Saying that she has cried for joy twice this year--when she won the gold medal at the Vancouver Olympics and when the Korean wheelchair curling team won the silver medal at the Vancouver Winter Paralympics - Olympic figure skating champion Kim Yu-na plans to donate her fee for appearing in a radio campaign for the rights of the disabled to the Korea Foundation for Persons with Disabilities. 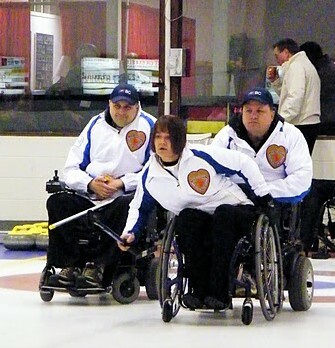 I'd like to thank those who have made a donation to support the wheelchair curling website and blog. Because of you, most of the expenses of putting them online this year have been covered. If you have been thinking about making a contribution in any amount, it's not too late. You can donate by credit card by clicking on the link at the top right hand corner of the blog, or you can email me at eric@wheelchaircurling.com for my address if you'd prefer to send a cheque. Knowing that my efforts are appreciated makes a difference not only to what I can do, but also to how motivated I feel to do it. A couple of years ago the Cape Cod CC undertook an extensive renovation of its 40 year old building, specifically to offer the opportunity for wheelchair users to participate in the club's activities. This summer the club is hosting an international spiel and Team USA and Team Germany have already committed to attend, as well as several domestic American and Canadian teams. Entry deadline has been extended and will now close May 9th. Contact Marc DePerno 315-737-2459 if you have any questions. Prior to the World Curling Federation's meeting in Cortina April 7th, a lengthy document was circulated detailing proposed changes to the eligibility rules for wheelchair curling. The document attempted to describe in highly tyechnical language exactly what degree of disability would be necessary for an athlete to become eligible to compete in WCF sanctioned events such as the World Championships and the Paralympic Games. The document attempted to draw a line somewhere between full-time wheelchair user and able-bodied, that included everyone with a significant disability affecting their lower limbs or gait such that a wheelchair would be necessary for them to curl. The regulations would have to be sufficiently specific and clear to allow eligibility of athletes to be determined by a classifier, but also in the event of a dispute, provide objective criteria for an appeal panel to judge a classification decision. At present there is no appeal protocol: the original classifier's opinion is final. Under the new proposal, curlers would be given a designation of qualified, or not qualified, or qualified subject to future review. Decisions to accept or reject an athlete could be appealed to a panel of two classifiers not involved in the original decision. It has, however, proven more complicated than expected to draw up clear and acceptable eligibility criteria, and the language in the original proposal was not accepted at the meeting and will be reviewed. The delay may mean that the new WCF rule book, due in June, will again not contain a procedure for appeal of an eligibility assessment. 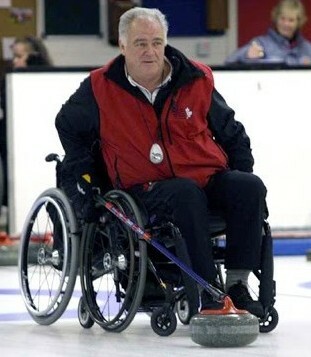 This issue should be seen in the context of Michael McCreadie's concerns that wheelchair curling is fast becoming a sport played by amputees and low level paraplegics to the exclusion of more significantly disabled wheelchair users, and against the guiding principles of Paralympic sport. Is it better for the future of wheelchair curling that the widest possible pool of potential participants be eligible to compete, or should it be. at least at the international level, a sport inclusive of a range of disabilities requiring wheelchair use? Is the decision different for countries with few facilities than for Canada with many? Wheelchair curling administrators are already discovering that the definition of wheelchair user is complicated and subjective; and that's just the beginning. "It's a natural fit," said club president Gord Jenkins, "given the types of improvements the club has made since its building was condemned a few years ago. The 2010 championship banner will hang in the Richmond CC as four of the five team members play there. The 2011 Worlds are scheduled for Prague February 21 - March 3, so it is possible that Sonja Gaudet, Ina Forrest and Jackie Roy will be available in 2011, potentially doubling the number of teams that may compete. National silver medalist Alison Duddy was profiled in the Quesnel Cariboo Observer. The sweet side of getting the silver medal Duddy said, was the one − two finish for the B.C. teams, and they did it on home ice in front of family and friends. Duddy also acknowledged the play of opposing skip Cormack, particularly in the gold-medal game, as one of the highlights of the tournament. CurlBC is inviting applications for its High Performance program which is open to all players and coaches in BC. Details can be found HERE. Finally, with Team Canada and the national championship final virtually all-BC affair, to what do you attribute BC's success, and what must happen outside of BC to broaden the spread of competitive honours? Is it simply success breeding success? The presence of Jim Armstrong? What do you think? The Royal Caledonian Curling Club, the national governing body for curling in Britain, has posted news from the AGM of the Scottish Wheelchair Curling Association. There were interesting points made on various topics which will be followed up by the Committee. The meeting closed with a vote of thanks to the Chair, and was followed by afternoon tea kindly hosted by South Lanarkshire Wheelchair Curling Club. Alas, no mention of what was in the sandwiches. Marc DePerno, team leader for the 2010 Paralympic wheelchair curling team, has received an O.C. Tanner Inspiration Award after being nominated by James Joseph. The O.C. Tanner Inspiration Award honors those frequently left behind the scenes. Those who ignited the spark. Encouraged the dream. Awakened the quest for glory. It honors those who will never receive a medal of their own. But instead made it possible for someone else. They say a person's true character is best demonstrated when they sacrifice their time and resources to help those in need. On October 15, 1987, I was working for Waste Management emptying a trash bin into my dump truck when I was struck from behind. A truck pinned me in between both vehicles. The extensive trauma resulted in the amputation of both my legs, but my life was spared. I was 25 years old and suddenly had no direction in life. I spent the next 16 years working random jobs and partying with my friends. I lived a life that truly had no meaning. In 2003, I learned of the Sitrin Success through Adaptive Recreation and Sports program in my neighborhood and contacted the program director. I spent 15 minutes talking with Marc DePerno on the phone that day, learning about the opportunity to engage in sports such as wheelchair basketball, racing and curling. I couldn't believe that this stranger wanted to help me. He encouraged me to come to his office immediately. Little did I know, my life was about to change. Initially, Marc taught me how to play wheelchair basketball and secured a grant for me to receive my own sport wheelchair. He then assisted me with training for a local wheelchair road race and even managed to find a way to get me my own custom-fit racing wheelchair. He introduced me to kayaking and canoeing as well. But my most life changing experience came when he introduced me to wheelchair curling. From the moment I threw my first stone in December of 2004, I fell in love with the sport. Since that time, I have won six U.S. National Championships, represented the United States at four World Championships and two Paralympic Winter Games, and won a bronze medal at the 2008 World Championships. Throughout the entire process, Marc has been by my side serving as my mentor, my guide and my friend. The countless hours he has spent away from his family to develop the STARS program and assist me, and dozens of others with disabilities, speaks volumes to his character. These past seven years have been the most productive of my life, not just based on my athletic accomplishments, but rather the things I've done off the field of play. Marc taught me that I could use my disability as a platform to educate others. He and I have traveled to numerous schools and community events promoting disability awareness. We routinely interview on our local radio and television networks. We speak with individuals who are recovering from traumatic injuries at rehabilitation centers and hospitals so they can realize the opportunities that lie before them. Additionally, I was nominated by Senator Joseph Griffo for the New York State Senate Achiever's Award as well as inducted into the central New York Optimus Hall of Fame for my commitment to serving as a role model in my community. These things were unfathomable to me earlier in my life when meaning and purpose was lost. My life has changed 180 degrees, thanks to Marc's intervention. Based on my new found direction in life, my wife and I decided to have a child and welcomed our angel, Janaya Rose into this world three years ago. She comes to my basketball and curling games and has become our team cheerleader. I know my life would not be as fulfilling if I was not involved with Marc. Marc's message is one of ability, not disability. Experiencing physical trauma isn't the end of being "you", rather a new chapter in your life. With his guidance and inspiration, my life story has become a best seller.